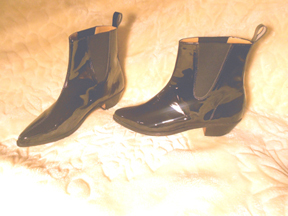 These Revolver boots were designed from many of the original pictures of the early Beatles wearing the boots, most of which were from the Sullivan era. Photo's from a Hard Day's Night were also used as guides to their authenticity. These Boots are hand made by a master craftsmen bootmaker that uses the softest , highest quality leather available today. Just as the outside of boot is high quality the inside as well is beautifully made, unlike many I have seen and bought myself. I too was in a Beatle Tribute band called Meet Revolver and played Ringo. I had the cheap boots (Blems)from another online source and they looked unfinished on the inside and very uncomfortable. They only offered one width and I have wide feet 4E. So I decided to create my own boots in any width and any size and make them with high-end materials with a master craftsmen and came up with the Revolver boot. Most Beatle boots out their don't use the double stitch like the Original Beatle Boots had. Revolver boots have the double stitch. I have seen Italian, German and USA bootmakers and these far surpass the quality and durability and cost of custom boots! I've been wearing "Beatles" Cuban heeled boots for most of my adult life and I've been looking for a well made pair for decades and then I found your boots. The quality of the components are superb and I get compliments about them all the time. The leather is the most beautiful and softest I've ever seen boots made of.. Thank you for selling them to me.